Sept. 2-13, a set on Flickr. My goal this year was to write up a blog post at the end of each week highlighting the activities at The Library@HHS. Oh well! Our BIG activity these past two weeks at The Library@HHS has been Library Orientation with the incoming 9th graders. For the last 8 years I have done Library Orientations using a fun scavenger hunt activity (http://www.nikkidrobertson.com/2012/08/library-orientation-scavenger-hunt-2012.html). This method worked well in a block schedule and in schools not implementing a 1:1 program. This year I am at a brand new school that operates on an eight period system and just implemented a 1:1 iPad initiative school wide. Our focus with Library Orientation focused on assisting students in setting up important apps to make printing, searching the library catalog, and checking out our eBooks a smooth process. Of course Library Orientation was just one of the many things going on in The Library@HHS. Some people fear that libraries will become obsolete as schools move to eBooks and 1:1 programs, but check out our calendar below and you will see THIS library is in NO danger of being obsolete! One fun things going on in The Library@HHS was happening in our computer lab was the Forensic Classes using the FACES program to make composite sketches. Students went to the Hoover High School website, pulled up pictures of teachers and worked on composite sketches of teachers. Some of the results were a HOOT! Ms. Camp, my wonderful co librarian, taught several classes on OverDrive and WEPA in addition to teaching Library Orientation classes. WEPA is one of my most awesome discoveries here at The Library@HHS. 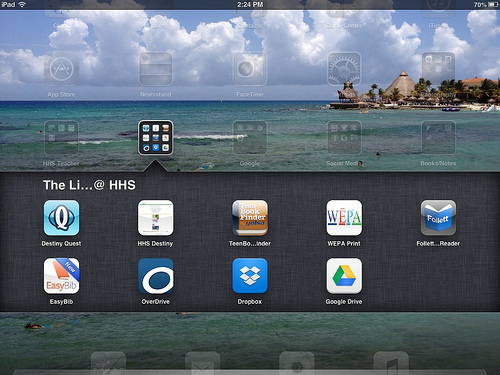 WEPA is how students print from their iPads. Maintaining the WEPA Printers is also one of the many duties of the librarians (me & Ms.Camp). During the week I also took a little time (lunch) to do a presentation for SimpleK12, Facilitate Easy Communication with Students and Parents. My presentation focused on Cel.ly. Click here for a link to my PPT. I also assisted two of my assistant principals, Dr. Sutherland and Ms. Hogan, to join a Google Hangout as guest speakers to the Fulton County Georgia School District Superintendent and Central Office staff as a favor to EdCamp Atlanta and EduVue tech star, Jaime Vandergrift. Student ID badges continue to be made with a big push for IDs right before the big game. Peer Helpers also came in to make special badges for their group. I also learned what can happen when you ask a student to use your iPad to take a picture! LOL! The week ended with an inspirational visit from Principal EL. His dedication to and love for students is contagious. Whew! The hustle and bustle didn't come to an end for me as I ran straight from Birmingham at the end of the week to Atlanta to host EdCamp Atlanta.